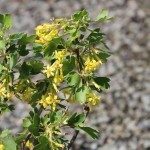 An erect shrub with light green leaves and clusters of fragrant, lemon yellow racemes of flowers in the spring. The summer berries are yellow to orange and tasty. It prefers some shade and a moist site. It is native to the Intermountain West and found in moist woods and along streams.